John Saunders reports: After the third round of the 2019 Gibraltar Masters, played on 24 January at the Caleta Hotel, we are now down to five players on the maximum score, only one of whom could be regarded as a member of the elite group from whom the winner would be expected to come. The five who have emerged from the mayhem are David Navara (Czech Republic), Bogdan-Daniel Deac (Romania), Gabor Papp (Hungary), Rinat Jumabayev (Kazakhstan) and the de facto leader in the hunt for the women’s first prize, Sarasadat Khademalsharieh (Iran), who is 94th in the tournament ranking. The top of the results list for round three has a curious aspect. There was just one decisive result on the top 12 boards, which was reminiscent of (if not quite identical to) the results of the recent Carlsen-Caruana match. The next 14 boards were the opposite of that match – 14 straight decisive results. Weird – how is it to be explained? The cut-over from defensive supremacy appears to occur when the higher rated player weighs in around the 2640s, or maybe it is when the lower rated player reaches 2480. Well, OK, not a representative sample but at least it’s a reminder that open tournaments have an advantage over small-scale closed events as far as the spectators are concerned; when the top guys don’t deliver decisive results, you only have to dig down to the lower boards to enjoy the chess equivalent of goal-mouth action. 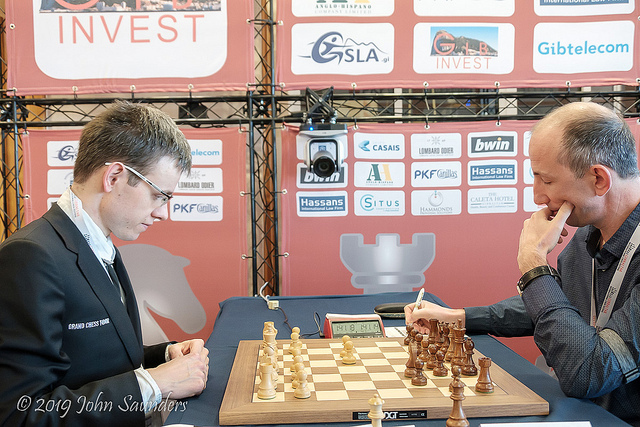 David Navara played this bright and breezy game to defeat the strong Israeli grandmaster Victor Mikhalevski. A strange position. It’s not often you see doubled pawns with an enemy pawn separating them. Aesthetics aside, the position now greatly favours White, with his control of the d-file and dark square complex. 24...Qb7 25.Rd6! Now Black can’t challenge on the d-file with a rook as White has Qd4+ followed by Rxd8. 25...a5 White is relaxed about 25...Bxg2, not for any tactical reason but because, after, for example 26.Rc1 Qe4 27.a5 Qxe3 28.fxe3 Be4 29.Rc7 Kf6, White has a huge positional plus despite being a nominal pawn down. At one time analysis engines were notoriously materialistic but Stockfish 10 assesses this as a huge +6 advantage to White. 26.Rc1 Rfc8 27.h4 Bxg2 27...Bd5 28.Rxc8 Rxc8 29.h5 is no better. 28.Qd4+ e5 28...Kg8 29.Rc7 Qe4 30.b7 wins. 29.Qxe5+ Kg8 30.Rc7 Qe4 31.Qxe4 Bxe4 32.f3 1‑0 If the bishop leaves the a8-h1 diagonal, 33.b7 wins and it has no good square on the diagonal. Wesley So was comfortably held by 21-year-old German GM Rasmus Svane. Le Quang Liem was lucky to escape with half a point as another 21-year-old, Indian GM Suri Vaibhav held what looked like a winning advantage for much of their game. Peralta-Artemiev was a complex-looking Grünfeld, but probably an opening laboratory battle. Women’s world champion Ju Wenjun looked under some pressure from Ivan Cheparinov (who is now registered for Georgia) but the former Gibraltar titlist couldn’t find a way to exploit his positional pressure. 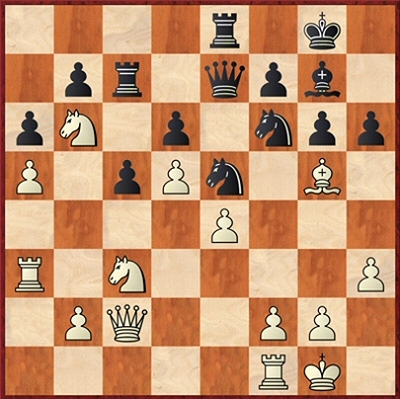 Gawain Jones’s game with Spanish GM Renier Vazquez Igarza came down to a tricky little rook endgame but it panned out to a draw with accurate play on both sides. Croatian GM Ivan Saric exited theory on move 13, but his divergence didn’t achieve anything special against a resilient Kateryna Lagno. Iranian IM Sarasadat Khademalsharieh played one of the most striking games of the day in defeating Alexander Donchenko. 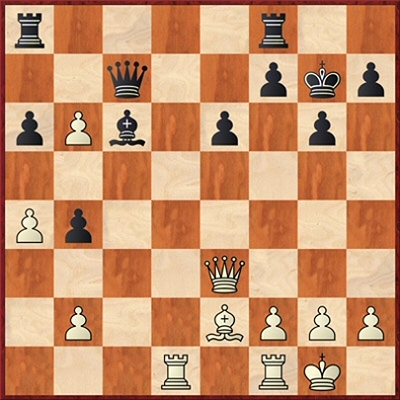 The 20-year-old German GM’s Benoni was given the full treatment after his rook was misplaced on c7. I have decided to award her the greatest honour I can bestow – a place in my MS Word auto-correct dictionary alongside Maxime Vachier-Lagrave and Rameshbabu Praggnanandhaa as a player with a long, hard-to-spell name which I am likely to need to type many times in the future. 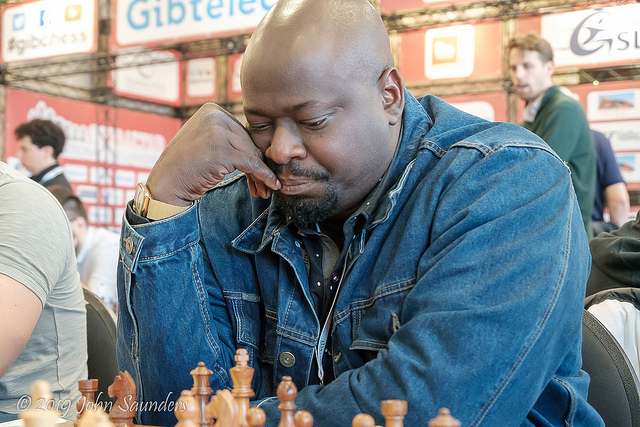 As for her illustrious colleague in my auto-correct dictionary: Maxime Vachier-Lagrave brought to an end the fine run of the Nigerian player Kolade Onabogun who had been such a brave GM-slayer in the first two rounds. Kolade put up a stubborn resistance and deserves at the very least to have his picture in this report.